(Newser) – A Roman-era treasure trove has been retrieved thanks to two strokes of luck. The first happened 1,600 years ago when a merchant ship carrying the statues and coins to be recycled sank in the ancient port of Caesarea in Israel. The second came last month when two divers discovered the wreck, reports Live Science. Ran Feinstein and Ofer Raanan found one statue, then another, but "it took us a couple of seconds to understand what was going on," Raanan tells the AP. "It was amazing," he says, noting he dives in the area on alternating weekends and hadn't made any big finds previously. 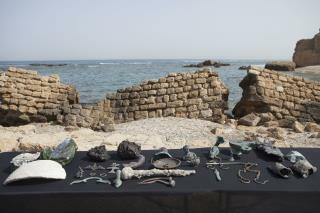 The Israel Antiquities Authority believes the ship got caught in a storm and smashed into rocks. Since the discovery, archaeologists have recovered priceless bronze statues and thousands of coins, per the Sydney Morning Herald and AP. Every year some new artifac or ancient site t is found in Israel. What are the odds? So, this was trash? In that case, the pollution of our great oceans has been going on for a lot longer than we thought! Those pesky Italians!